How Can Cold Chain Monitoring Reduce Logistics Cost? A well-run supply chain reduces transit time, enhances customer service, and saves money. Those savings don't come easy though, and they're rarely accomplished through sweeping changes. Rather, they're the product of incremental improvements to processes and a proactive approach to risk-management. Good shipping operations develop organically over time, evolving in response to specific events, imperfect operations, or a drive to improve efficiency. That drive to improve efficiency is itself driven by a singular purpose — cutting costs without cutting corners. It’s tough to do one without the other. The problem is, you need to be flexible on the cutting costs bit, because without cutting corners is non-negotiable. While it’s difficult to balance the cost of cold chain risk management with the need to reduce costs, supply chain managers today have an advantage their predecessors didn’t — the advent of IoT, and real-time cold chain monitoring. Real-time monitoring of goods is now possible during storage, multi-modal transport, and throughout a supply chain. The advantage of real-time shipment monitoring is the HUGE difference it makes to cold chain risk management, which in turn lowers cost. It’s enabling supply chain managers to upgrade risk management from passively reactive to real-time proactive — they’re not just preventing risks now, they’re actively countering them. Learn how you can reduce your cold chain cost arising from spoilage, transportation, operations, and crisis management using real-time monitoring and IoT. Real-time condition monitoring can help reduce cold chain costs by reducing its biggest problem — spoilage. Although temperature-sensitive shipments are best handled by personnel that are trained and familiar with the complexities of cold chain transport, outside logistics staff and 3PLs are entering the mix. Training, process adherence, equipment maintenance and contingency/crisis management protocols may not always be followed. By monitoring shipments in real-time and instantly flagging issues such as temperature excursions, hardware/coolant malfunctions, or deviations from handling protocols, you can take measures to prevent damage in transit. A minute in transit is a minute at risk — and that’s especially true for cold chain shipments. Temperature-sensitive cargo that exceeds its ideal temperature thresholds could be damaged irreparably or have a shorter shelf life. With real-time monitoring, you’d be able to detect that, and compromised shipments could be rerouted to a repackaging center or alternative market before it’s a complete sunk cost. Loading cold chain products into containers/transport that haven’t been cooled/preconditioned. You can also tell when temperature excursions damage products in-transit, like when refrigerator doors are left open too long or when containers/products get compromised due to rough handling. The added advantage of real-time monitoring and alerts is that you can somewhat reduce spends on cold chain risk management without running the risk of increasing spoilage. Reduce handling costs, because lighter, tighter cargo takes less effort and heavy machinery to handle. Containers or warehouses sometimes develop hotspots, small areas or zones where the temperature may exceed acceptable norms. Real-time tracking — especially at the package level — can help detect that, allowing you to act instantly and mitigate damage. In the off chance you can’t act immediately, you can still contain cost impact by discarding the compromised cargo rather than the complete shipment. There are a lot of cutting-edge and customizable packaging options out there that can make a HUGE difference to cold chain cost-efficiency. Moving to a reusable packaging solution that uses phase-change material allows you to maximize your payload. What’s holding them back is cost — they’re not easy on a logistics budget. It’s not the expense of purchasing them that’s the issue here, you easily recover their cost — and then some — through savings from reuse, reduced product damage, and other improvements in supply chain efficiencies. The problem is that reusable packaging isn’t always returned. There are, however, real-time tacking solutions for reusable shipping assets that can help ensure that expensive reusable cold chain containers are exactly where they should be. 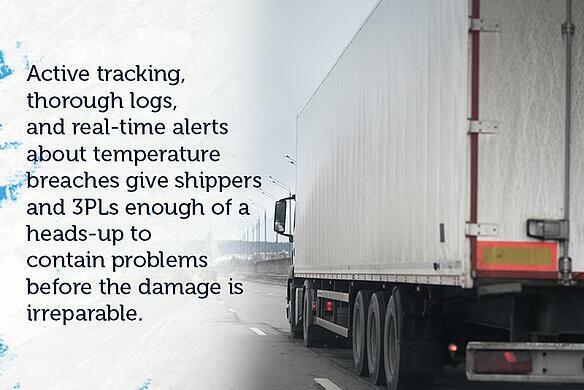 Active tracking, thorough logs, and real-time alerts about temperature breaches give shippers and 3PLs enough of a heads-up to contain problems before the damage is irreparable. Detecting temperature excursions in real-time means you know to ship replacement goods before the spoilt shipment arrives, saving time while reducing spends on expedited shipments. Real-time tracking coupled with solutions like ePOD and automated invoicing can help issue bills and collect dues faster. Automated electronic systems help bypass the usual lag while paperwork catches up, allowing you to settle your own debts faster and save interest on working capital. The benefits of real-time shipment tracking don’t stop at optimizing delivery schedules, it also helps reduce the burden of paperwork — and its delays — in your day-to-day operations. Issuing and managing invoices, organizing delivery schedules per customer preferences, responding to queries or concerns in-transit, and checking up on progress manually, all add to the overall complexity — and cost — of running a supply chain. 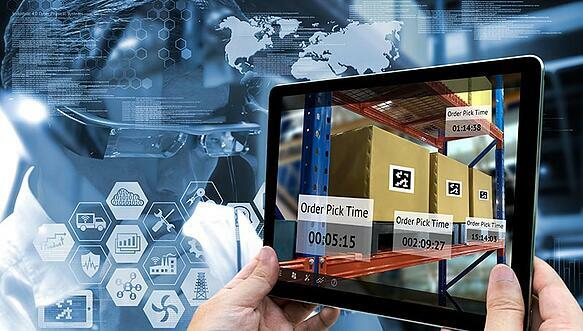 Real-time tracking coupled with analytics dashboards and automated notifications could help reduce all that, fulfilling everyone’s needs without requiring the manual intervention that older supply chain management systems demanded. want of proper paperwork, it’s a life-saver when the driver or logistics personnel can use their smartphone to download whatever they need to verify paperwork or fulfill compliance. Instant audits and verifications, reducing the cost of delays due to inspections. Maintaining the ideal temperature for your cargo isn’t enough; you also have to prove you did it. Real-time tracking data and secure online logs can help reduce the time taken to fulfill regulatory requirements, allowing your cold chain shipments to breeze through customs without breaking a sweat. While there are cheaper passive temperature loggers available that do just that, it takes a while to read data from those loggers and generate temperature logs; more so if you’re checking a large number of packages for verification and compliance. Learn about the evolution of cold chain monitoring technologies from data loggers to Bluetooth temperature sensors to IoT. How much can you save from Reshipping, Detention, and Working Capital? Use Our Cold Chain Savings Calculator and Find Out! Having a reliable real-time shipment tracking and monitoring solution that doubles-up as a quality management AND process automation system could really help take a load off. Some real-time cold chain tracking solutions do just that, speeding up or automating activities that help improve, if not outright replace, slower manual processes. While the direct benefits of such efficiency aren’t instantly evident, there are several indirect — but significant — gains that not only reduce your operational costs, but also help add to your bottom line. There’s no business like show repeat business. Keeping your customers happy is the real secret to success. Real-time shipment tracking can help you do just that, allowing you to ensure that shipments arrive at the right time, in the right condition, at the right location. Cold chain monitoring can help your customers — and you — sleep tight, every night. You can also share real-time tracking data with consignees, allowing them to monitor their own shipments. This not only improves your customer’s experience, but also frees up the day, since you’ll have fewer frantic calls from customers at odd hours asking about their shipments. One of the biggest advantages of tracking logistics data is the ability to gauge performance, over time, telling you your best options when picking routes, modes of transport, packaging, 3PL, as well as the likelihood of spoilage for that combination. The best you can hope to do with that level of analytics is prevent risk. But prevention isn’t always better than cure. Cold chains overcompensate on things like packaging, mode of transport, or choice of 3PL to offset inefficiencies in their risk management plans. Real-time monitoring adds a whole new dimension to your insights, allowing you to adjust everything on the fly while keeping costs low. You can, for instance, select the slowest (but cheapest) mode of transport and keep packaging to a bare minimum, without worrying about the “likely” outcome — real-time tracking will allow you to define the outcome. Real-time data enables real-time analytics, and response. 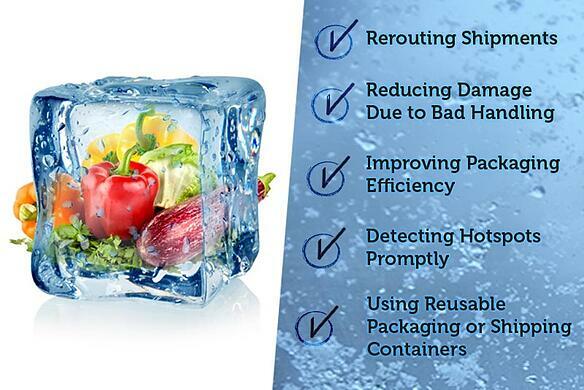 You can use that to do more than just prevent cold chain risk, you could outright eliminate it. If your shipment gets delayed or your coolant runs low, you’d know about it fast enough to dispatch a recovery or refit team to resolve the issue. The cost of such intervention is often lower than the cost of overcompensation over time, allowing you to run a leaner AND reliable cold chain. Modern cold chain equipment excels at doing its job. The problem is, that equipment can be complex, and “complex” usually means “easily broken”. Some real-time asset monitoring solutions take that into account, helping you maintain cold chain equipment regularly, thereby reducing the chances of a costly breakdown on the road. While the cost of cold chain risk management may be high, the cost of cold chain failure is always extreme. 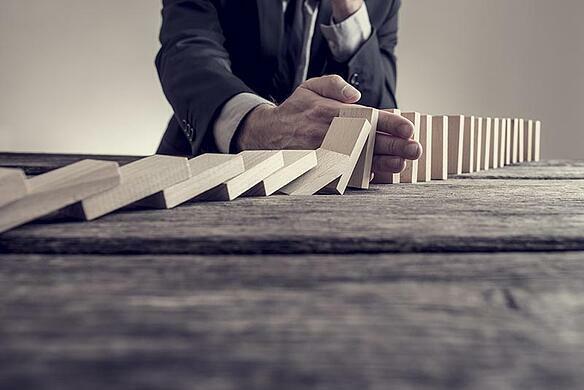 Downstream ripples such as loss of consumer trust, loss of market share, or in extreme circumstances, even the loss of life, can sink even the hardiest of companies. Through package-level cold chain visibility, it’s easier to single out compromised consignments, allowing you to recall only the spoilt products rather than the complete shipment. But, the real savings are from not having to deal with liabilities that cost millions of dollars for your company, and worse, put lives at risk. Learn how Roambee’s End-to-end Cold Chain Monitoring Solution Can Put You in Control of Your Cold Chain Today! Whether it’s to bolster the bottom line, fulfill regulatory requirements, meet customer expectations, or boost shareholders’ confidence, cold chain logistics need options to improve supply chain efficiency while stabilizing costs. Real-time monitoring and intervention could help accomplish that. Managing budgets against your expectations requires a careful look at the variables of your specific situation. It’s also important to consider your complete cold chain logistics process when you’re trying to identify scope for savings. While you could reduce spoilage with better refrigeration or reduce transport costs with multi-modal shipments, there are hidden costs to your choices. Labor, weight, spare parts, compliance mandates, all contribute to the complexities of managing cold chain shipping costs. It’s logical to think of cost reductions from the bottom-up, but the push to evolve needs to be top-down — Big Data can help support the big picture you’ve got in mind, but like any tool, you need to use it right. Real-time shipment monitoring and intervention will be just a small — albeit vital — part of your overall efficiency game plan. Rethinking conventional wisdom, embracing new technologies, and leveraging new tools such as the Internet of Things (IoT), all have the potential to increase cold chain efficiency, reduce costs, and boost the value of your service. Companies that take steps toward becoming an always-on-always-online enterprise will see spectacular success. Are Wireless Sensors Better for Remote Temperature Monitoring in a Warehouse? Join hundreds of companies across the globe already using Roambee's innovative technology and affordable "pay-as-you-go" model to monitor their shipments and their assets in the field, with no upfront investment in hardware or software.